What better way to get into a Valentines mood than with a love story … ? When we first started Happy Skincare we really didn’t know what we were getting ourselves in for. Running your own skincare care business didn’t appear to be that hard. Well we were proven wrong. Would you believe that we even had trouble trying to give our products away for free!? That was because there was one extremely important thing missing. Luckily for us we had our eyes and hearts opened to what was missing. 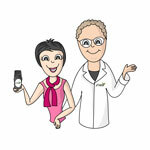 We knew wanted to run a natural skincare business but we didn’t fully understand why. A simple email from a lady, Anne, asking for some skincare advice that could help her during chemotherapy and radiation therapy changed everything. You see, the general advice given to cancer patients was to use sorbolene cream but she wanted something natural. This one simple request gave Happy Skincare a purpose. At the time, we didn’t know anything about the skin conditions suffered by cancer patients or what products would be suitable, but we jumped in anyway and started researching. The more we looked into it, the more we realised that this seemed to be an area of care that was severely lacking options. We were determined that Sorbolene cream shouldn’t be the only option. After all, it’s usually just made up of mineral oils and parabens. After many hours of research it became clear that chemo treatments leave skin severely dry, which takes away skin’s protective barrier. If we could come up with something to help this then it may make things a little more comfortable for those who had to go through the challenge of chemotherapy. The thing we came up with was the TLC Intensive Repair Oil (but it didn’t even have a name back then – Anne dubbed it “Anne’s Miracle Oil”). We blended 6 nourishing organic oils that would give the skin back something that it had lost after chemo. Anne had some really wonderful results from using the TLC Intensive Repair Oil, and she even surprised her nurses with how her skin held up during her treatments. And that was how this simple oil became the first product we fell in love with – because it helped someone – even if in a very small way. We were so eager to head out and help as many people as we could. But we couldn’t. We have had to be very careful in telling people about the TLC Oil, because it is not classed as therapeutic product. The arms of the Therapeutic Goods Administration are far reaching and we didn’t want to risk a law suit!! One of our amazing customers, Kerry, invited Aaron to speak at her breast cancer support group. And that’s what we did with the pure intention of being helpful. After encouragement from some of the groups Aaron visited with, we tried approaching medical professionals to see if they were interested in hearing about the TLC Intensive Repair Oil. By that time we had received so many heartfelt “thank-you” messages. How could the professionals ignore that? We had some incredible support, most of all from some of the local breast care nurses, but despite the support we weren’t getting the attention of the people who we really needed to convince – the oncologists. To grab their attention we would have to conduct a very expensive clinical trial that was way out of our reach. It has been a few years now since all that has happened and we are incredibly proud that the TLC Intensive Repair oil is now recommended by some medical professionals and pharmacists in the Hunter Valley. Mainly because they have been there and seen firsthand how it has helped their patients. And that makes us love the TLC Intensive Repair Oil even more. So the TLC Intensive Repair Oil wasn’t a turning point in the history of Happy Skincare, it was the starting point. It showed us why to make a skincare product and why Happy Skincare should exist. Above everything else we need to be honest and helpful to you. So with Valentine’s Day next week we are going to celebrate it by being truly grateful for every person who has tried our products. You have allowed us to grow and be more helpful to others. The post Our First Love – The Story behind the TLC Intensive Repair Oil appeared first on Happy Skincare.